This is an update of a previously posted article. We are continuing to see newest versions of locks bought at the big box stores coming with plastic parts. Remember, to be sold cheap, cheap locks need to be made cheap. 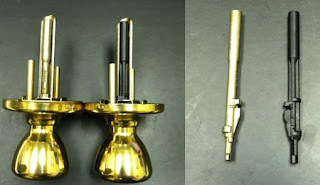 A few months back ACME Locksmith discovered that the new Schlage SecureKey lock contained plastic parts. Being a Phoenix Locksmith service, this disturbed us greatly. This lock is no longer manufactured, but that hasn’t stopped Schlage from putting plastic arts in their newer models. The locks we buy and the locks the big box stores sell have the same part number, but as you can see, they’re not made the same. Arizona summer temps are routinely above 110 degrees (hit 113 this week), and when you put a shiny metal part on a sun exposed door, you’re going to get temperatures far higher than that. How are these plastic parts going to hold up in the AZ sun? 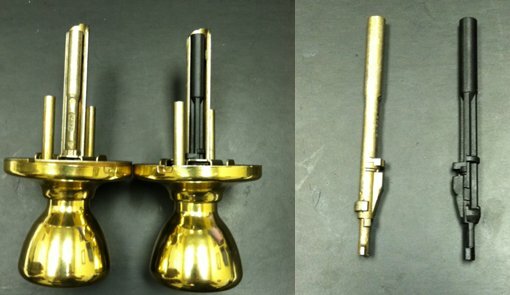 Just yesterday we discovered that Schlage’s largest competitor, Kwikset, is now also using plastic parts. The plastic parts are found on the hardware you would see at the big home improvement stores. 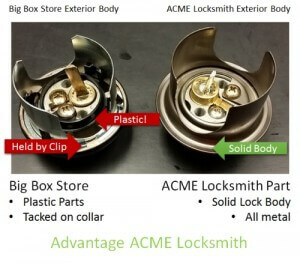 At ACME Locksmith, we sell something called “light commercial grade” door hardware for homes that use Schlage hardware. It’s always been a heavier duty, more secure product than those found in the big-box stores. Now that those stores are selling product with plastic parts, the use of the light commercial grade for Phoenix homes is even more compelling. For Kwikset, we sell a locksmith brand with the same keyway, and that brand has no plastic parts, so we’ll continue to recommend it.